"Hey there, space cats! Ulala here, comin' at you from Spaceport 9." 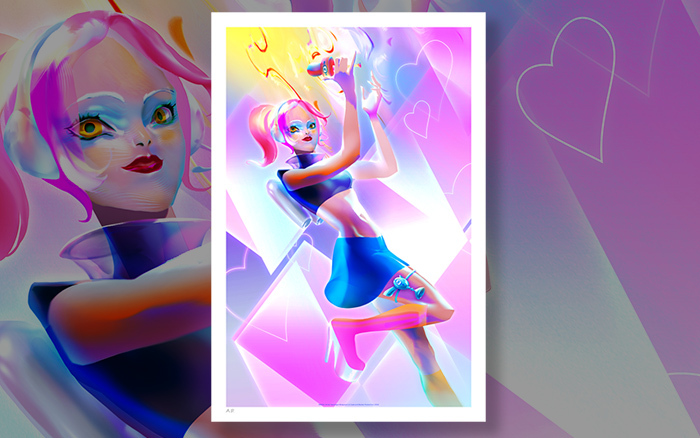 We teamed up with SEGA and known art director, illustrator and floral arrangement designer Veronique Meignaud to bring you this beautiful, decorative Space Channel 5 art print featuring star reporter Ulala! Space Channel is the cult music game directed by Tetsuya Mizuguchi (Rez,Child of Eden) and was first released in 1999. Artist Veronique Meignaud specializes in visual development for media and video games and has worked for companies such as Arkane Studios, Electronic Arts, Wizards of the Coast and Ubisoft. Her artwork has been featured in international galleries and published in art books and magazines and she created art for games such as Dishonored, Far Cry, Wakfu and Child of Light.